Allergy & Asthma Specialists of North Florida physicians specialize in a host of allergic disease conditions. They offer state of the art diagnostic and treatment options to help you breathe easy and enjoy a healthy, active lifestyle. If you’ve been diagnosed with asthma or allergies, you know how these conditions can disrupt an active life – especially for the patient who loves being in the great outdoors. With the abundance of asthma and allergy treatment options available today, one no longer has to feel limited by allergy or asthma. If you are one of the 34.1 million Americans who suffer from asthma or the 20 percent of the U.S. population with allergies, treatment for allergies and asthma related conditions is our specialty. Our expert allergists Dr. Edward Mizrahi, Dr. Patrick DeMarco and Dr. Thomas Lupoli offer help with a variety of conditions. 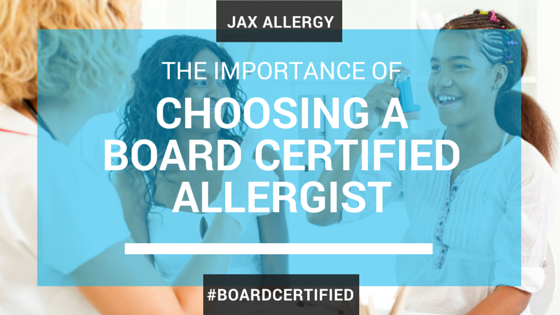 Click on a link below to read more about specific allergy conditions we treat. For more specific information about our specific treatment options, please see FAQ section. We offer diagnostic services, asthma and allergy treatment and lifestyle modification guidance to help you avoid allergens and asthma triggers and successfully manage your allergy or asthma. We also have four convenient Northeast Florida locations: on Normandy Boulevard, University Boulevard and in Mandarin in Jacksonville, and in Orange Park in neighboring Clay County. For asthma and allergy treatments that afford you a healthy, active lifestyle, call Allergy & Asthma Specialists of North Florida today.